The Bradford R. Boss Arena, located on the campus of the University of Rhode Island, opened its doors on September 15, 2002. 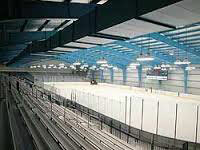 This state of the art ice rink is the very first indoor ice facility in all of Southern Rhode Island. Currently, the Boss Ice Arena operates year-round, opening its doors 7 days a week, 52 weeks out of the year, for over 15 hours a day. With a seating capacity of 2,500, Boss Ice Arena includes two University team locker rooms, four large public locker rooms, one female auxiliary locker room and an official’s locker room. In addition, Boss Ice Arena features a University team weight room, a pro shop that is owned by 2nd Time Around Sports, Inc. and a hospitality room that’s available for birthday parties, meetings, classes and corporate events. Open daily, Subway is also a featured aspect of the arena, acting as the facility’s concessionaire. 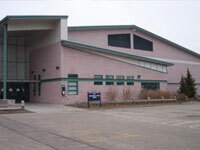 The Bradford R. Boss Arena is home to the nationally ranked University of Rhode Island Men’s and Women’s Club Ice Hockey teams, as well as the University of Rhode Island Intramural Hockey league, daily public sessions, various youth and adult hockey leagues and a Learn to Skate program. Additionally, during the summer, Boss Ice Arena also hosts a variety of hockey camps and clinics. Pro Shop: Operated by the Boss Arena Pro-Shop, Owner of 2nd Time Around Sports, Inc.